This is my first tutorial!! So excited about it! 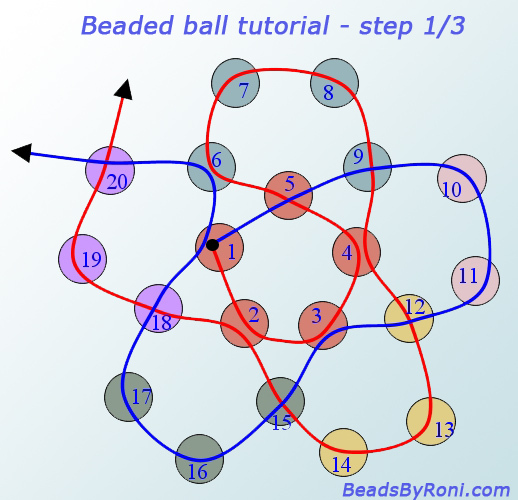 This tutorial will be for a nice beaded ball (also called “soccer ball” because of its shape). 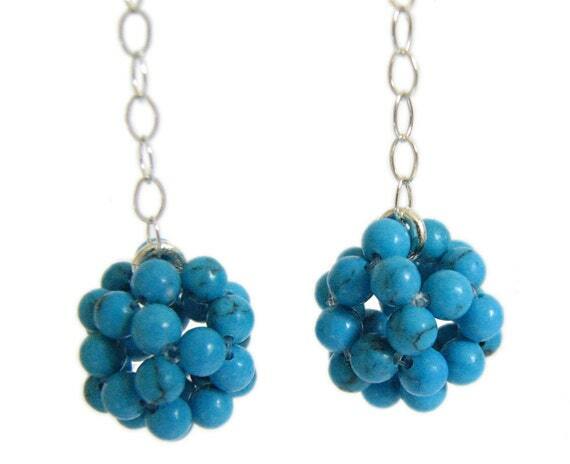 The final result is a nice little ball that can be used as a pendant, connected together with other balls for a bracelet, or (as I used it) connected to a chain and ear wires (see my Etsy listing for Turquoise Howlite ball). For simplicity, I colored each side of the fishing line, so it will be easier to use the appropriate color throughout this tutorial. 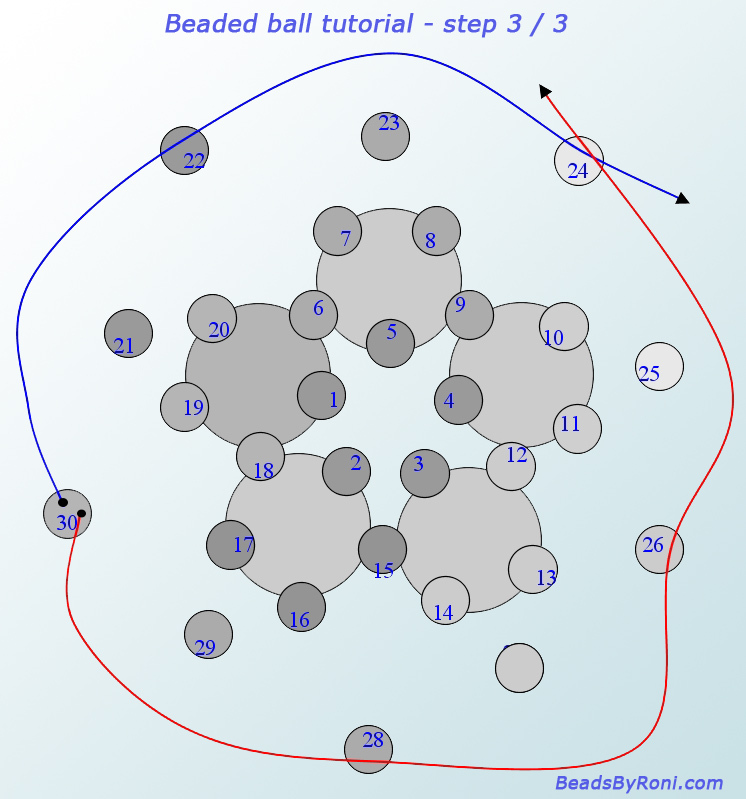 Start by threading 5 beads on the fishing line, cross the 2 side at the 5th bead (Step 1, beads 1-5). Thread 4 more beads on the red, cross the 2 sides at the 4th bead (Step 1, beads 6-9). Thread the red through bead 4, add 3 beads to blue thread and cross at bead 12 (Step 1, beads 10-12). Continue this way 3 more times until both side? cross at bead 20 (Step 1, beads 13-20). Continuing from bead 20, thread 2 beads on the blue, thread the red through bead 7 and cross at bead 23 (Step 2, beads 21-23). Thread 2 beads on the red, thread the blue through beads 8+10, cross at bead 25 (Step 2, beads 24-25). Continue previous step 2 more times (Step 2, beads 26-29). Thread one bead on the blue, thread the red through beads 17+19+21 and cross at bead 30 (Step 2, bead 30). 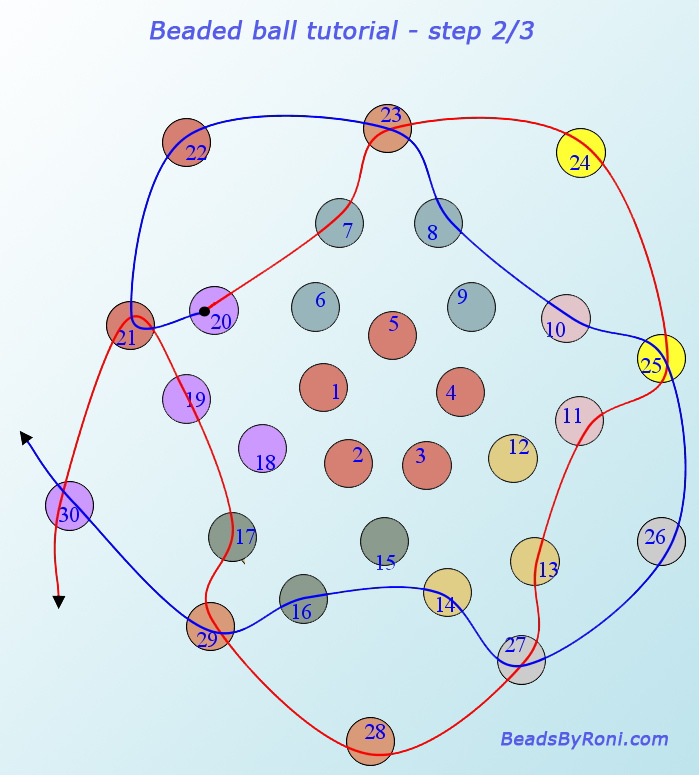 Continuing from bead 30, finish the ball by threading the red through beads 28+ 26+24, and the blue through 22 and 24. Make a knot, cut off excess fishing line. Now you can use your new beaded ball for your jewelry ! Why Is Beading A Craft Of Excitement & Satisfaction? I was wondering how we were going to help it hold its form…..wire of course. I’m new to jewelry making, but this looks easy enough to follow, thanks! No need for wire. Just use nylon thread or fishing line. You’ll be surprised to see how strong the form is after the final tie of the thread. You could even have used fireline and it would stay put. That is so cool, and looks pretty easy! Thank you for the great tutorial! Those are so awesome!! I’ve been playing with beads and wire in making jewelry recently and it has been so much fun! I love the look. And these definitely just made it to my list of “must create” lol. Thank you! Your pictures are so helpful! I was a little confused by the second diagram, but once I saw the example you made it was easy to follow. Thanks for taking the time to do this! Wow, looks nice. Great explanation. Great tutorial. I am passing this along to my niece who is into jewelry making right now. This is so well done. I think I could actually do it! I have a friend that has tons and tons of beads so Ill be passing this on. They are really cute….and easy! What a great tutorial! I am going to try this! Thanks for the tutorial! I use fishing line when I bead too! you make this look soo easy but i don’t think i could do it haha! Great tutorial! My daughter will absolutely love learning how to do this. Thanks for showing us how it’s done! Thanks for the tutorial. This is on my list of crafts to try. Thanks for d tutorial;it has really help me cos av been searching for how to make beaded ball but dis has really made my day.Thanks$GOD bless u.
thanks dear for such a great tutorial..luv it..
Tanx a lot for this tutorial. I must say your instructions are more explanatory than the others I found online. My ball finally took shape. Excited!! Great work. I really appreciate the insight here in this post and confident it’s going to be helpful to me and many others. Thanks for sharing all the information and tips. 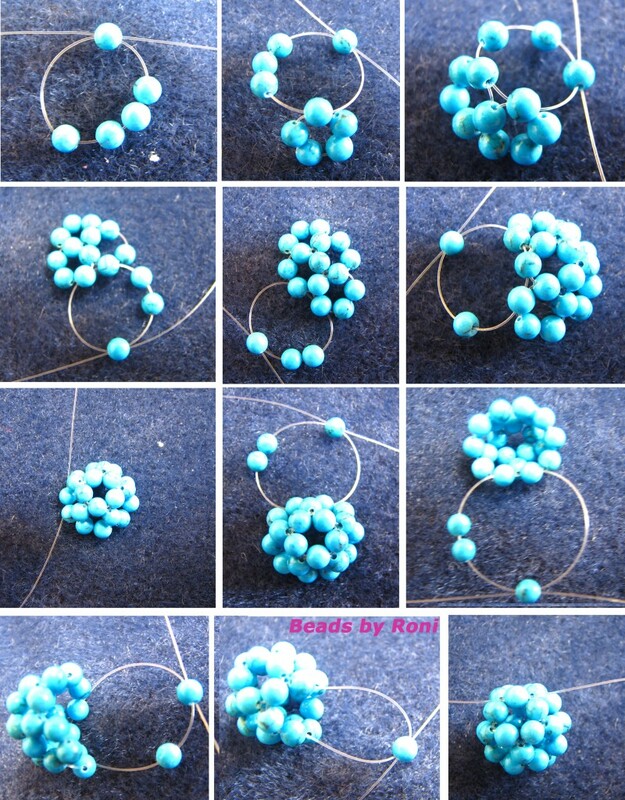 Good job, I just started beading recently & so far this is the first well illustrated tutorial I have seen. Hi admin, do you monetize your website ? Hello blogger, i must say you have very interesting articles here. you can earn extra bucks every month because you’ve got high quality content. updates will give your website higher rank & authority in google.